We have built two production lines on this beautiful land Georgia for two consecutive years. 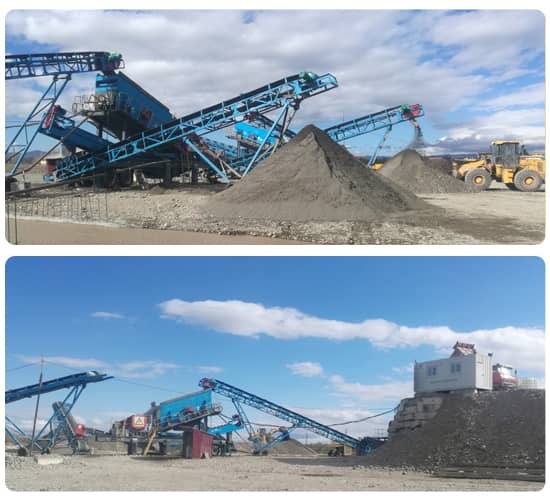 The main equipments are: ZSW4211 vibrating feeder, ASD3625 jaw crusher, 3YKR1854 vibrating screen, DHKS5112 jaw crusher, PFQ1315C impact crusher, 2YKR2160 vibrating screen, and sand washer, supporting mobile trailer, belt conveyor and full set of mobile centralized control system. In 2018, the Georgian production line achieved strip production at an amazing installation speed. At the request of the customer, this production line arrived at the site together with the company's service engineer, and it took only 12 days to bring the material into production. Why is it so fast? This is from the scene of the Armenian production line in 2017. The construction of this production line, the customer also agreed to a six-month service period. Because of the high tacit cooperation between the two parties, we spent three months to achieve the whole line. Perfectly delivered and delivered to achieve customer satisfaction. During these three months, our service engineers provide customers with a full range of services, from site leveling to equipment foundation release; from equipment component hoisting to line lying; from stand-alone commissioning and maintenance to system configuration of the entire line. Maintenance and coordinated production between each device, we have done the most in-depth service guidance training, won the praise of customers; equipment is operating normally, the customer's operators are proficient in the use of equipment, and the entire production line is demolished The installation work is deeply understood and has been fully and systematically studied. It is precisely because we have a professional and perfect pre-sales and after-sales service system, and have a good reputation among the customer groups, so that the company's products will always occupy the market.